Susan G. Komen is the world’s largest breast cancer organization, funding more breast cancer research than any other nonprofit while providing real-time help to those facing the disease. Since its founding in 1982, Komen has funded more than $800 million in research and provided $1.7 billion in funding to screening, education, treatment and psychosocial support programs serving millions of people in more than 30 countries worldwide. Komen was founded by Nancy G. Brinker, who promised her sister, Susan G. Komen, that she would end the disease that claimed Suzy’s life. Visit komen.org or call 1-877 GO KOMEN. In 1995, with proceeds from its first Race for the Cure, Komen Montana began its mission of providing breast cancer education and screening throughout the state. The Montana Affiliate of Susan G. Komen was officially formed in 1999 to carry out the promise of Susan G. Komen. An existing group of dedicated breast cancer survivors, breast health advocates and others continued to work tirelessly as volunteers. In 2007 the Affiliate hired its first Executive Director. In 2010 Komen Montana achieved a landmark goal of having awarded over $1 million dollars in grants throughout the state. Since 1999, Komen Montana distributed 67 community grants totaling almost $1.5 million to provide over 7,000 mammograms and distribute education materials to tens of thousands of Montanans. One of the greatest disadvantages for people living in Montana can be the access to mammograms. Priority funding has been for free mammograms to women in impoverished, rural areas. Komen Boise and Komen Coeur d’Alene were both founded in 1999. Komen Boise originally covered 5 counties in southwest Idaho but later expanded to cover 19 counties in southwest and central Idaho. Komen Coeur d’Alene covered 5 counties in Northern Idaho. In April 2012, Komen Boise united with Komen Coeur d’Alene to become Komen Idaho and cover 19 counties in southwest, central, and northern Idaho. In April 2015, Komen Idaho expanded to cover all 44 counties in Idaho, providing services in Eastern Idaho for the first time. Since 1999, Komen Idaho has granted over $5.4 million dollars that stays in our local service area and is dedicated to breast cancer awareness, education, screening, support and treatment in Idaho. In June 2015, The Idaho Affiliate and the Montana Affiliate merged to form Komen Idaho Montana. The merging of the Affiliates strengthens Komen presence in both states allowing for more focus on the mission of saving lives and ending breast cancer forever. 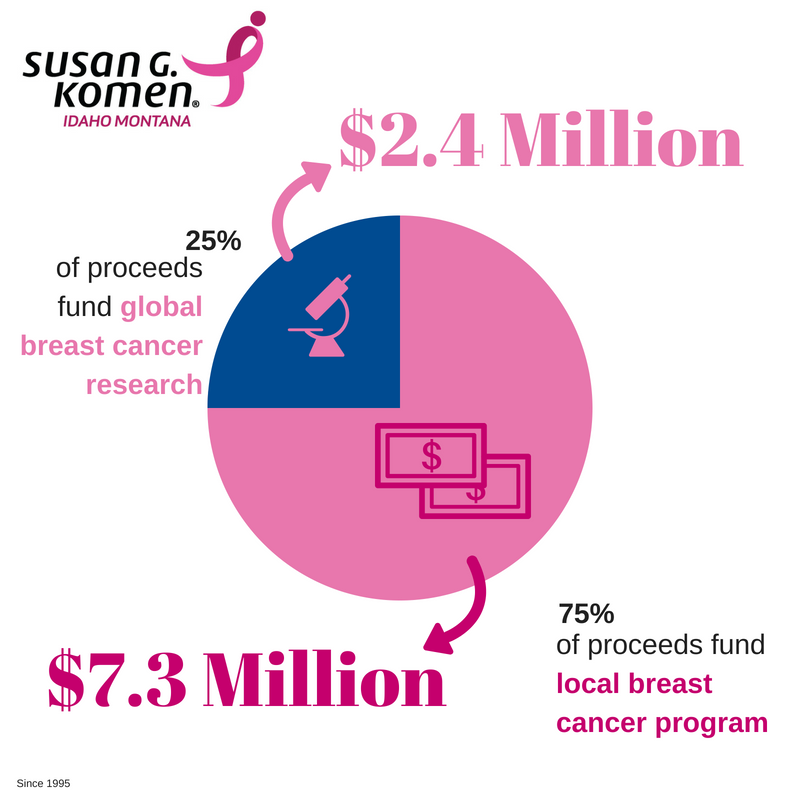 We donate 75 percent of net funds raised to vital local breast health services, and dedicate the remaining 25 percent to national research to find the cures.